If you’re reading this guide, you have probably had enough of your pooch’s destructive behavior and you’re looking for a solution. If so, you are not alone. Chewing is a natural instinct for dogs. They have been known to chew through materials such as wood, brick, and even metal. Most of these beds don’t stand a chance against larger breeds, causing you stress, mess, and ultimately leaving you with less cash in your wallet! Chew proof dog cots are made from more resilient materials and have less “weak spots,” preventing your pet from finding a way in. There are many models out there, some more heavy-duty than others and they come in a variety of designs and sizes. Some are also designed for heavier breeds, who can quickly flatten a low-quality bed. So for owners of larger breeds, we’ve got your back, too. Here is a funny video, it explains what happens with ordinary, cheaper cots. To help you make the right choice, we have done our research and compiled a guide to different factors to consider. Plus, we’ve gone through tons of reviews and selected some of the top models on the market in 2019. Stick with us! If you’re in a hurry make sure to check out our top pick, K9 Ballistics Orthopedic TUFF Bed: It’s good for light to moderate chewers, with completely zipper-free and orthopedic design. Not to mention 10-year guarantee against flattening which is a total bonus. Why the Buddy Rest Crown Supreme Orthopedic is not on our list? You might be wondering why I didn’t include this product from Buddy Rest in this review. Well, let me tell you. It is true that Buddy Rest are award-winning company, and this particular bed is orthopedic as well as chew-resistant. However, since the price tag on this product is very high, it didn’t quite make it to the top 5. Plus, it does not cater to all dogs, as there are no small sizes for the little ones. There are products of similar quality on the market that are much more affordable and which cater to all, such as the K9 Ballistics listed below. Intended for light to moderate chewers, this bed from K9 Ballistics is said to resist 90% of chewing dogs. The super durable 1680 denier Ripstop Ballistic Nylon cover protects against chewing and scratching as well as water, hair, dirt, and odors. It can be easily wiped down or machine-washed in cold water. It is zipper-free; instead, they use a single Velcro closure. As for the levels of comfort, it features a 5 inch-thick orthopedic mattress with two layers: a 1.5 inch layer of contouring memory foam for comfort on top of a 3.5 inch layer of dense support foam. The company is confident enough to give a 10-year guarantee against their orthopedic mattresses flattening. Plus, if your puppy manages to damage the bed within the first 90 days, they will replace the cover for free. A handful of customers reported that it was cold and firm, and a bit uncomfortable for their pets. As advertised by the company themselves, it is not the toughest of beds. Some dogs managed to chew through nylon. So you have an aggressive chewer, you may need to opt for a more heavy-duty model. Sometimes, you might even want to place it in an indestructible cage for extra safety. This model from Kuranda is advertised as an ultra heavy-duty dog cot that is chew proof and can support up to 250lbs. So, it’s a good choice for larger, heavier pets as well as the more determined diggers and chewers out there. It has a lightweight, aircraft-grade aluminum frame. Sounds pretty high strength, doesn’t it? Your puppy is elevated off the ground too which is a nice addition. This is an orthopedic design that keeps it cool and comfortable, as she will get airflow all around her body. It can be used outdoors as well as indoors. The bed base material is made from the company’s strongest fabric, solid vinyl. The fabric slides inside the frame, so there are no edges asking to be chewed. It also has a smooth surface, which means it has no weak spots, plus it’s easy to clean. Kuranda claims that their beds have proven their durability as they have been used in active shelters and kennels worldwide for over 10 years. Each bed is covered by the Kuranda 1 year warranty. Some customers report that this product is tricky to assemble, so if hands-on jobs aren’t your strong point, you might want to ask a friend to help you out! This one is for larger dogs only, who – let’s face it – need a whole lot of leg room and a supportive sleep surface. It features a headrest and 7” 3-stage orthopedic foam to give your bigger puppy’s joints the support she needs in addition to the comfort that every dog has a right to! It starts with a 2″ layer of Comfort Foam, leaving it resting on a 3″ middle layer of firm Support Foam, which is followed by another 2″ layer of Comfort Foam below. It supports every part of the body, protecting the joints from pressure points. According to Big Barker, this patented technology is even relied on by rocket scientists at NASA! The company only uses high-quality, American-made foam, which comes from a small Californian workshop. No mass-produced, cheap materials here! The company provides a “can’t flatten, won’t flatten” promise, claiming that the foam will retain 90% of its original shape and loft over 10 years, or your money back. This bed comes with a tough microfiber cover, which is soft to the touch, and machine-washable, so it’s easy to clean. 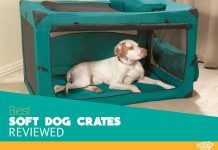 If you’re looking for a dog crate bed for large breeds, you probably couldn’t do much better than this one. It’s very popular among customers and in the majority of cases seems to hold up on its promises. It supports the weight without sagging or sinking. On the downside, the larger two sizes are pretty pricey, but it’s well worth paying that bit more for the quality. This bed is a great choice for small or medium dogs (and can even work for cats, too!) It features a double-thick fitted mattress for a supportive surface that will also keep her warm throughout the night. Its bolstered sides will give your dog a feeling of security, plus they are set at an angle to support her back and head. If your pooch often displays that natural bed-scratching instinct when it’s time to tucker down, you don’t have to worry – the thick microsuede material of this bed can withstand a good scratching. Another great feature of this bed is its lovely, colorful design, which will look great in any home. You can choose between champagne beige and tango red, or champagne beige and brilliant blue, each sporting a beautiful paisley pattern embroidery. Plus, the finishing touch – an adorable bone-shaped neck pillow in one corner, which is embedded with a squeaker. So your furry friend will get extra support and some fun, too. Talk about sleeping in style! The majority of customers give this dog bed a big thumbs up when it comes to comfort and durability, and also for its stylish design! A downside is that this bed comes with a weak spot – zippers! These are to remove the outer cover for easy cleaning. They are, however, very durable and hidden away from curious little noses. This chew-resistant Deep Dish dog bed is built to be sturdy, yet soft and comfortable, for medium-sized dogs. It features a “ToughChew” fabric outer layer made from 1,000-denier ripstop nylon, finished with a soft, microfiber sleep surface. To make it even tougher, Orvis include an 840-denier nylon inner layer. Sturdy, bronze zippers enable the removal of the outer cover for washing. Orvis are pretty sure of this product’s durability – they promise a refund if your dog can chew through this bed. This bed has a streamlined shape, somewhat resembling a miniature sofa, which looks great in any home. It’s a good choice for more aggressive chewers, diggers, or scratchers. It only comes in one size, so it’s not the top choice for smaller dogs – unless you want to give your little one a lot of legroom! 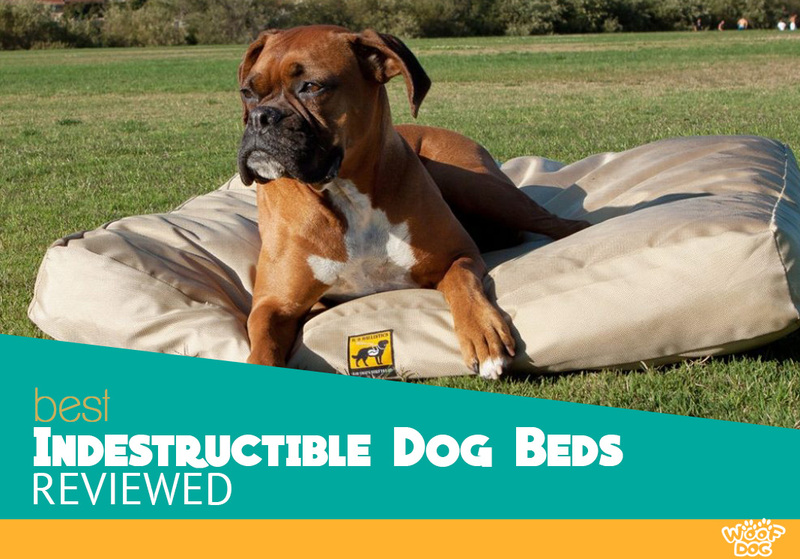 Unchewable dog beds come in a variety of sizes and designs and are made from different materials. This means there will be one to suit your furry friend, but it can also be confusing when it comes to narrowing down your choices. You will need to consider just how tough you want it to be. Do you need one that is resistant to a light chewer or one that is ultra resilient and for the more stubborn pets? You will need to decide the type of outer material based on how aggressive your pet is. Specialist materials used in the outer layer are essential when it comes to making cot that’s chew-proof. If your dog is a light to moderate chewer, heavy-duty nylon or canvas should suffice. If she is a particularly avid chewer, tougher materials may be in order, such as PVC and solid vinyl. Other benefits of these materials are that they are easy to clean in case of any accidents, and they are also waterproof. These are often included on dog beds to make the outer cover removable, but for curious noses, they could be the start of mega destruction. Good alternative: Industrial strength Velcro that is hidden away from prying noses on the bottom of the bed. Corners, edges, anything sticking out – that’s the first place a dog with a strong chewing instinct will start to gnaw. Chew proof alternative: Rounded corners and streamlined shapes are a better choice. That way, your dog won’t be able to grab onto anything! Weak or visible seams are a no go. Remember, those teeth have been known to break metal – she will have no trouble breaking through stitches! Indestructible Alternative: Well-sewn, durable seams that are hidden from prying eyes! For ultra durable seams, some beds are sewn with Kevlar. Yep, that’s the same material used to make bulletproof vests! If a bed is tough it does not necessarily have to be uncomfortable. There are quite a few options out there offering durability as well as comfort. The interior fill will determine the comfort and, according to Drs Foster and Smith, also the support and longevity. If your loyal companion is wee (i.e. a toy or small breed), a cot with a softer support is probably a good option. For example, a dense memory foam interior might be difficult for these dogs to get comfortable on. Instead, look for products that are poly-filled. Larger breeds will need something stronger. This means a sturdy surface that can hold their weight without sagging. Since large breeds are often prone joint problems, orthopedic beds made with comfortable yet supportive memory foam are a good choice for them. Memory foam contours to your pet’s body and relieves pressure points, so she will be comfortable and well-supported support. Some products may just have one layer, while others can have up to 3. Usually, a good quality one will have a layer of at least 5” foam. If she likes to sprawl and stretch out as much as possible, from snout to tail, a mattress-style bed will provide her with adequate support. Dogs who curl themselves into a ball shape (fox style) usually do well with a soft, well-cushioned sleeping surface and high walls. For the more senior pets who may be experiencing painful joints, an orthopedic cot’s are the probably the best choice. They are designed to alleviate pressure points and come in a variety of styles. Your pup’s teeth may well have gone and chewed up one too many beds and you’re at your wit’s end. So, you know the main advantage is the satisfaction it will bring you to see her come up against something and lose, for once. They are usually easy to clean, as they are often made from fabrics that can be wiped down easily. So, in case of accidents, dirty paws, or spills, you can clean it up in no time. Many also come with a removable cover that can be machine-washed. If your dog is an avid chewer, you’ll know it can be a messy experience. All that interior fill and bits of fabric everywhere… With these, it’s all in the name – unchewable = no cleanup for you. Chewing is a natural instinct, especially for puppies, who are teething and exploring the world with their mouth. By giving your pup something to chew, you can keep her habits away from her sleep surface and direct them to appropriate toys instead. Some of these beds are designed specifically to withstand heavier pooches. These are usually more supportive than a regular pet mattresses, plus they are less likely to flatten or sag. This makes them longer-lasting, so your big hound can stay comfortable for years to come. Some products are made from waterproof materials can be used indoors as well as outdoors. So, whether you want your dog to join you in the garden or if she just enjoys reclining in the sun, it can do so in comfort. If you have found yourself replacing sleep surfaces due to destructive chomping or digging habits, it’s a good idea to make the transition to a more sturdy bed for your pooch. Indestructible dog crate beds can be a real lifesaver for those determined chewers or diggers as well as for those with larger breeds who need a sturdier sleep surface. 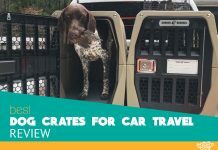 They will save you money and stress, they’re easy to clean, plus if you get it for your pup from day one, they could help deter her from destructive bed behavior for life. They come in a variety of models, so you’re bound to be able to choose one to fit your pet’s size, sleeping style – not to mention chewing style! K9 Ballistics Orthopedic TUFF Bed came in at number one as the ultimate indestructible dog bed for a few good reasons. It comes in all sizes to suit any breed. Intended for light to moderate chewers, it has a ballistic nylon cover that is zipper-free and can be easily wiped down. It also features a highly comfortable and supportive memory foam interior mattress, which is great for joint support. Finally, as we’ve mentioned before, the company is confident enough about their product to offer a chew proof guarantee for the first 90 days, plus a 10-year guarantee against flattening.